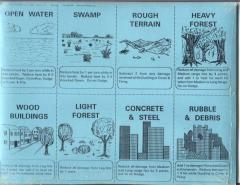 Terrain Card set used with the Battletech Combat Books by Nova. Each time a player makes a maneuver that changes range, that player draws a new, random, terrain card. The terrain cards are used to change the amount of damage a Mech may take, the amount of heat generated, or the maneuvers that the Mech may choose. There are 64 cards in this set and the terrains included are: Barren Earth, Open Terrain, Open Water, Swamp, Rough Terrain, Rocky Terrain, Light Forest, Rubble & Debris, Wood Buildings, Heavy Forest, and Concrete and Steel.